Jen Mirabile: Wear an animal to school! Wear an animal to school! 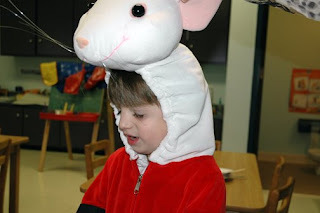 Last week Andon's class was all about animals. 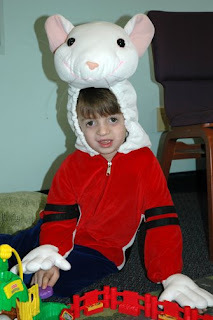 So on Friday his teacher told all the kids to wear clothes to make them look like an animal. What she meant was a grey shirt to look like an elephant, a striped shirt to look like a zebra.. you get the idea. Jen, would you please tell Nancy that Beth Wright (Betty's daughter) says hello. It really is a very small world! sounds like something my nephew would do... thats too cute!!! Oh man, Andon's so cute! I remember talking to you a while back about your sweet guy, so thanks for finding me because being able to put a name to a face is great for me. Your little guy is beautiful! Yes, Noah's little neighbor way back when at TCH Denver also had TC. Such a peanut...like so beautifully formed by the Lord...I can't explain it. You know because you get to look at him every day, but those other kids and adults who have said ignorant and hurtful words, they haven't had their eyes opened to see true beauty...so, in addition to praying for wisdom for you guys, God's timing and direction, I pray for people everywhere who do not have the love of God in them to be able to recognize and truly savor BEAUTY when it's staring them in the face!